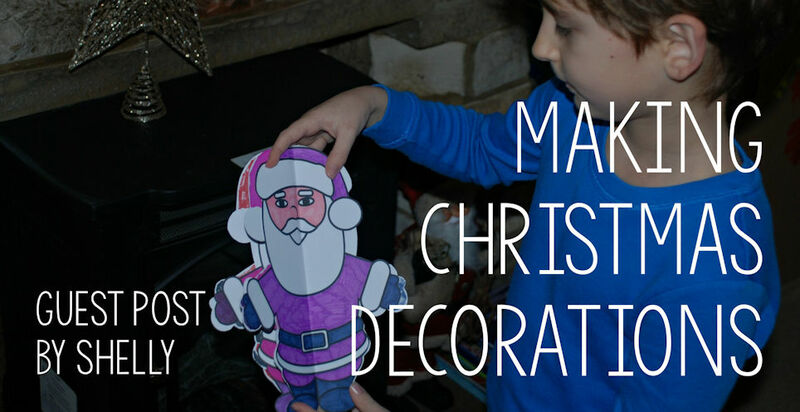 Every year the kids make a few new Christmas decorations and for some reason most years there always seems to be a theme – totally unintentional – this year they seem to be all about making standing 3D decorations. It started with our Christmas angel. My daughter wanted to make an angle to stand on the window sill of our front room so that you can see if from the road. So we downloaded the Christmas angel page and printed it out onto card. My initial plan was that we could stick the angel onto an empty toilet roll. But after we had cut the angel out I realized the angel would be able to stand by herself. All you need to do it only glue the top section (her head shoulders and wings) and then on the body section just glue the edges of the front and back so her dress naturally forms a bit of a circle. If you do that she stands perfectly fine on her own. And it also means that you could always use her at the top of your Christmas tree if you wanted. After seeing the standing angel my son wanted to create a standing Santa. I looked for a Santa Claus picture that was fairly symmetrical and we went with this one – Father Christmas colouring page – with a Santa picture you are never going to get it exactly symmetrical because of the hat on the one side but with kids crafts we never go for exact we go for fun. My son started colouring each Santa in a different colour and even managed to persuade his sister to create a purple and pink Santa for him to use. Then we cut them all out and folded them in half length-ways. We glued the consecutive halves of each Santa to each other (so the 2nd half of the first Santa is glued to the 1st half of the second Santa, then the 2nd half of the Second Santa is glued to the 1st half of the third Santa, the 2nd half of the third Santa is glued to the 1st half of the four Santa and the 2nd half of the fourth Santa is glued to 1st Santa – once you get into it, it is really quick and easy). And the colourful Santa’s look brilliant! The only problem is my son can’t decide where he wants it to stand and keeps moving it around the house so now we have a moving colourful Santa instead of a standing Santa. Showing off the lovely Santa he made! and Santa by the Christmas tree! We also had a go at creating some 3D stars – using the same gluing method as we used with the Santa’s. For each star we cut out 4 same sized templates – we actually used the stars from the cutting practice page for this. For some of the stars we painted the yellow card with some glitter paint that the kids had which gave a really lovely effect and we also created some stars were we alternated colour card – so yellow, orange, yellow, orange. Once stuck together the stars do actually stand perfectly on their own. But my son agreed that they really suited the Christmas tree.